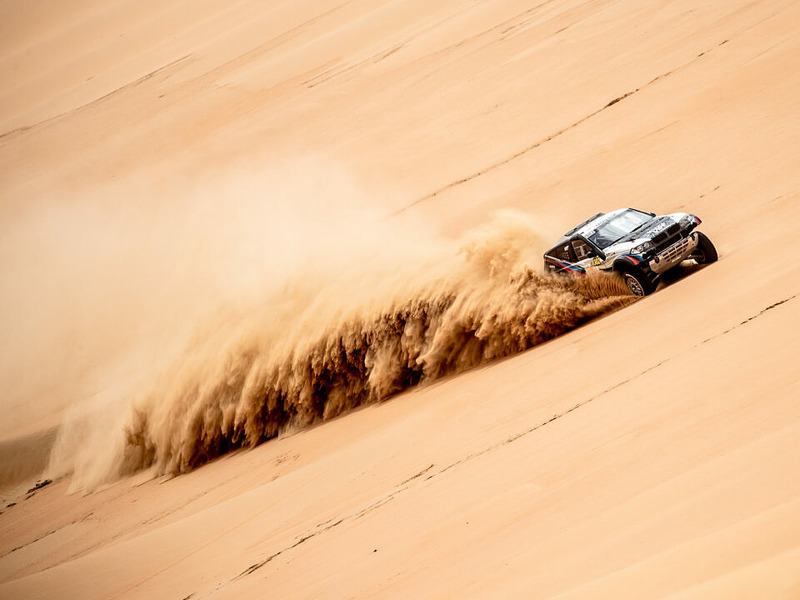 The fourth of five racing days of the FIA World Cup for Cross-Country Rallies second round – the Abu Dhabi Desert Challenge – finished today in the United Arab Emirates, the southeastern part of the Persian Gulf. The beginning of the longest rally raid leg was marked by the problems of yesterday’s stage winner – Jakub Przygonski did not start on Wednesday due to technical problems with the gearbox of his car. The crew reached the special stage start, but could not continue moving and returned to the bivouac to pass the car to the mechanics. The Pole was forced to skip the day, having received a substantial portion of penalty hours for it. Martin Prokop also retired for technical reasons. Vladimir Vasiliev and Konstantin Zhiltsov gradually improve their results in the intermediate race classification – today the Russian crew have completed the stage in the top three, thus winning back several positions in the final classification and rising to fourth place. The day was difficult and exhausting, the next circle stage was not successful for two crews: the Dutchman Bernhard ten Brinke, who fought for the second position overall yesterday, has had an accident today, where his co-driver Tom Colsoul suffered – the racers were taken to the hospital by helicopter, but injuries did not pose a risk to life. A similar story happened to the Omani Abdullah Al Zubair, and the helicopter was used for evacuation again. Vladimir Vasilyev, driver, “At about the tenth kilometer of the route the tyre began to be lowered, and we stopped to pump it, having spent several minutes for it. We were caught up with Casey Kurrie in the Maverick and we couldn’t get away from him for about 20 kilometers; the American was driving well – with our pace. Later on the track we caught up with Aron Domzala and overtook him. And he drove behind us for about 200 kilometers. Approximately 40 kilometers before the finish we had another wheel beaded, when we caught up with Sheikh Khalid Al-Qassimi; we “handed over” Domzala to him”. The dune massive was not easy for the drivers and their cars, and there was a lot of work for the co-drivers. Both the local racers and the participants who came from afar were experiencing problems. Today Sheikh Khalid Al-Qassimi has actually driven a 2WD car – after he has allowed his buggy to “dig in” several times, one of the drives broke. The Czech Miroslav Zapletal had a hard time in the sands – the day was not good, the drive broke and then there were the problems with the electric system. Tomorrow is the final day of the 2019 Abu Dhabi Desert Challenge rally raid – there are 214 competitive kilometers from 352 kilometers of the leg total distance; and after that the best drivers will receive their awards for the five-day competition at Yas Marina circuit.